The Kintyre Way Ultra route is roughly 75 miles in length and contains around 7000 feet of climbing. What makes it even tougher and more interesting is the varied nature of its terrain, and inevitably this raises countless questions about equipment choices. 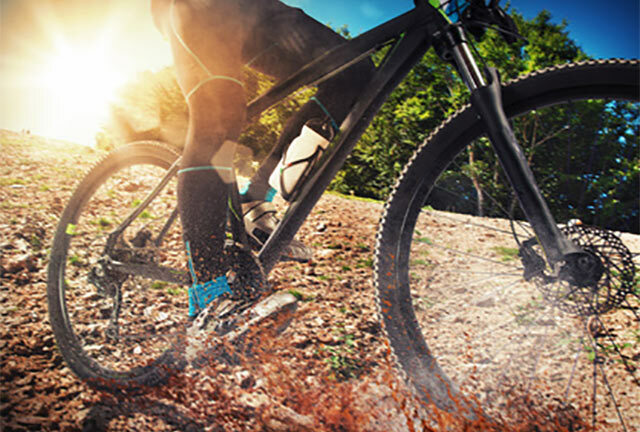 Should you use a mountainbike? Can you ride it on a cross bike? Which will be faster, and which will help you conserve more energy? What tyres should you choose? Will a 1×11 setup give you a wide enough spread of gears? These are just a few of the questions I was asked before the race last year, in my amateur capacity as “the guy who had probably ridden the route more than anybody else”. Having effectively negotiated the race on a relatively inexpensive cross bike in 2017, I will admit that I still don`t have all the answers. On the day, my bike was fitted with cable disc brakes and Schwalbe Smart Sam tyres and I felt that it performed very well over the varied terrain. I could climb quickly and had plenty of grip, and I gained valuable time on the tarmac sections between Clachan and Tayinloan and then again between Ballochgair and the finish in Campbeltown. It was extremely compromised on the descents when pitted against the mountainbikes in the race, though getting down the descents at a reasonable pace required commitment and induced serious mental and physical fatigue. When Stephen and I rode this loop recently from Corranbuie to Claonaig, he rode a hardtail mountainbike fitted with draggy Maxxis Minion and High Roller tyres and he struggled badly to keep up with me on both the climbs and descents. It amused me greatly watching him have to pedal furiously on the descents while I freewheeled alongside him, but it did showcase once again how important bike set-up is if you want to maximise your experience of tackling a race of this magnitude. I feel that I have taken my cost-effective cross bike as far as I can, and that considering that it is standard save for those Schwalbe tyres and some vibration-reducing Kinesis carbon forks, it undoubtedly offers fantastic value for money in terms of race performance per pound spent. What I am curious to find out though, is how much faster I could be if I had the opportunity to set up a cross-country mountainbike specifically to tackle the varied terrain of the Kintyre Way. I have no doubt that even with basic suspension forks and the increase in grip that wider tyres would offer I would be substantially quicker on the downhill sections, but how much would I have to spend on a mountainbike to be quicker on that than I am on the cross bike overall? Would it need to have a carbon frame? Would a simple 1×11 gear spread give me enough gears to negotiate the steep climbs AND the steep descents, or would I need a double set-up that might increase the possibilities of mechanical issues? What tyres would I go for to give me the best compromise between rolling efficiency and confidence-inspiring grip? We have teamed up with our sponsors at Wheels Cycling Centre in Callander to attempt to answer these questions and more as we work our way through all the sections of the race route. Wheels will once again offer competitors a hire service with full race support to anyone who wishes to use one of the bikes from their extensive fleet, and they have kindly agreed to set up one of these bikes for me so that I can attempt to answer all of the set-up questions that I posed at the start of this section. Armed with all the information that I have compiled throughout many enjoyable days spent riding all over the stunning scenery that the Kintyre Way traverses, I should be able to set up a steed that works pretty well, but it will be invaluable to have the experience of the team at Wheels to suggest finer details that might help me to cover the ground even more quickly. We will share whatever discoveries we make in future updates of this blog, so stay tuned if you are as big a bike geek as I am! If you are interested in making use of one of the hire packages that Wheels Cycling Centre has to offer, or you plan to enter the Kintyre Way Ultra and you feel that now would be a good time to treat yourself to a new bike and you want to speak with somebody who can give you all the unbiased advice you need, then give John a call on 01877 331100 and tell him that we sent you.